With the Giants coming out victorious, the clock starts ticking toward the start of the free agency period. Teams have five days after the conclusion of the World Series to make qualifying offers to their free agents. Those players then have another week to make a decision. Although the Phillies are extremely unlikely to offer any of their free agents a qualifying offer, but pitcher A.J. Burnett has the same time to notify the Phillies if he will exercise his 2015 player option in his contract. Burnett, who will be 38 at the start of the season, can return to the team if he decides pick up his $12.5 million player option in the contract he signed last February. That option rose from $7.5 million, because Burnett was able to make 32 starts during the 2014 season. After the 2014 season, Burnett was uncertain if he wanted to come back for his 17th big-league season. With that said, Burnett clearly didn’t have his mind made up after going 8-18 with a 4.49 ERA last season, while pitching through a sport hernia injury. Burnett did lead all MLB pitchers in the loss and walk departments though. If Burnett takes his players option, the 2015 Phillies five-man rotation could look like Cole Hamels, A.J. Burnett, Cliff Lee, David Buchanan, and Jerome Williams, with Jonathan Pettibone as a possible sixth man. Mike Adams, we hardly knew ye. Adams signed a two-year, $12 million deal with a club option of $6 million for 2015. For his $12 million, Adams made 50 appearances, fewer than Adams' average season. For the Phillies, Adams posted a 3-5 record with 14 holds and no saves. Adams pitched to a 3.96 ERA in 2013 and a 2.86 in limited action in 2014. Earlier this offseason, the Phillies had stated that the entire coaching staff from 2014 was "invited to return". That meant, of course, that those not under contract would certainly be allowed to pursue other options before deciding to accept. The Phillies announced today (via Todd Zolecki of MLB.com) that the entire coaching staff will return in 2014. Bowa had a two-year deal when he was brought aboard prior to 2014, but others were working on one-year deals. You may have heard a lot this past season about JP Crawford and Maikel Franco, but another Phillies prospect is grabbing some attention in the Arizona Fall League. Just 5-foot-10, Roman Quinn was originally a shortstop prospect for the Phils but has since been switched to centerfield, where his speed could become an asset in the future. In yesterday's game, Quinn helped the Scottsdale Scorpions defeat the Peoria Javelinas, 6-2, with his first home run in the AFL. Due to a ruptured Achillies tendon, Quinn missed the start of the 2014 season, but still managed to hit a career-high seven home runs. During the second half of the season, Quinn got his speed back, stealing 29 bases in 67 games. Quinn is down in the Fall League for multiple reasons, one being his approach at the plate. This season he only walked 36 times and went down via the strikeout 80 times in just 88 games. Quinn spoke with Jake Seiner of MiLB.com about how the progress is coming along with his offensive game. "I think I'm getting more mature and stronger from both sides of the plate. I'm recognizing the ball a lot better than when I was younger." "I feel like I'm getting a lot better out there. I'm definitely learning," Quinn said. "My walk-to-strikeout ratio [is what's improved most]. That's one thing I want to do, is cut down on my strikeouts." Quinn also leads the AFL in stolen bases, swiping 10 bags while getting caught just twice. In addition to his first homer hit, Quinn also has a triple and five RBI's to go along with a .354 OBP in 14 games for Scottsdale. The Arizona Fall League announced their Fall Stars Game rosters yesterday and it included Quinn on the East Division roster along with Phillies farmhand Nefi Ogando, who is 1-0 with a 1.86 ERA in 9.2 innings for the Scorpions. Ogando is a possible replacement on the 40-man roster for B.J. Rosenberg, who was removed yesterday. "It's definitely a blessing," Quinn said. "I'm very excited to play in that game. It's going to be a very fun time playing against some of the best players in the Minor Leagues." Rehabbing pitcher Adam Morgan is 1-0 with a 5.79 ERA for Scottsdale in 9.1 innings pitched. In his most recent start, he allowed two earned runs in four innings of work, striking out three and walking one. Morgan is recovering from surgery on a torn rotator cuff that caused him to miss the entire 2014 season. Tony Gwynn Jr. Andres Blanco. Sean O'Sullivan. Now, B.J. Rosenberg. All are gone. Cesar Jimenez and Grady Sizemore are guaranteed some money to come back. Kyle Kendrick, Mike Adams, and Wil Nieves are all free to walk away in a week when free agency begins. Nefi Ogando and Roman Quinn have already made an off-season All-Star team. Adam Morgan is back throwing a baseball. That's a lot of news for a team who's season effectively ended in July, at least at this time of year. It leads one to think that the Phillies know they don't have time to "let the market sort itself out" this year, not after a second straight 73-89 season. They are active, and active quickly. Will Tomas be a Phillie? Well, I believe so, and I don't believe that the Phillies will let money get in the way. I don't think the Phillies feel their outfield is good enough right now. If Tomas is not a Phillie, that means someone else is, and I don't think the Phillies will be shy about getting a mid-order outfielder to bolster the offense. The Phillies enter the off-season with a rotation that has Hamels, Lee, Buchanan, Williams, maybe Burnett, Morgan, Pettibone, and Miguel Alfredo Gonzalez. Will they settle on making a five man rotation out of that? My guess is no. While I am not seeing them signing a Lester/Scherzer/Shields type of free agent right now, I do think they either get a solid mid-rotation free agent, or sign an international free agent (or posted from Japan) arm. Past Aaron Nola, the Phillies have nothing in the system to feel super confident in today. There are too many health risks and low upside arms in that group. Will the Phillies move Ryan Howard or another veteran? I think it's a lock. I prefer it to be Howard, but I'm not opposed to moving Utley, Byrd, or Ruiz if it frees up money and roster space to give other guys a look. I'd try to keep Jimmy Rollins around for this season and see how J.P. Crawford does with the eventual jump to Reading and maybe beyond. So that's basically to say a minimum of three moves of note are coming, and that's besides hopefully giving Maikel Franco and Darin Ruf a shot to win spots in Spring Training as well. If the Phillies make five substantial changes to the 2014 roster, that won't make them a 90 win team (at least not necessarily), but it should start them on some kind of pathway out of the last-place finish they found their way to in 2014. The Phillies continued to cut down their 40-man roster today, removing B.J. Rosenberg. The 29-year-old reliever cleared waivers and has cleared waivers and been outrighted to Lehigh Valley with the option of electing to become a free agent. A 13th round pick in the 2008 draft, Rosenberg never consistenly pitched well this season, posting a 6.75 ERA over just 13 games for the Phillies. After finishing 2013 strong, Rosenberg looked to be a solid 6th or 7th inning guy for Ryne Sandberg, but could never develop any sort of comfort level on the mound. He went 2-1 with a 5.73 ERA in 22 minor league innings as well this year. The Phillies now stand at 38 players on their 40-man roster and that will drop after Wil Nieves, Kyle Kendrick and Mike Adams become free agents next week. According to Matt Gelb of the Philadelphia Inquirer, Nefi Ogando could replace Rosenberg on the roster. He was named to the Arizona Fall League all-star game, posting a 2.08 ERA in seven outings. If the Phillies choose not to put him on the 40-man, Ogando could be selected in the Rule 5 draft. As the sting of the 73-89 season both fades and is aggravated by the World Series being on, the off-season is well under way. Here are a few thoughts by me on the events so far. While I think Pat Gillick is the smartest man in baseball, the Phillies interim President is posturing by saying the team won't contend for at least two years. As you all may re-call, he made the same comment on the day he traded Bobby Abreu in 2006. A little over a year later, they won the NL East. Gillick knows as well as anyone that once you put your team on a right-track, the pace back to being good is out of your control, or your best predictions. He may very well be right with this one, but that depends on how radical the makeover this Winter will be. I hated the idea of re-signing Jerome Williams back in the Summer, as I felt it would take away an opportunity from a younger arm. Given how the prospects ended up their Summer, and given Williams' flexibility to be a starter or long-man, I'm fine with this move. This probably means Kyle Kendrick is gone, and that is at least some financial savings. In line with that- Hamels, Lee, Buchanan, Williams, Morgan, Pettibone, Gonzalez, and maybe Burnett are the list of potential rotation contenders for next year. I personally want to see a front-end of the rotation veteran brought in through free agency or a trade. I don't think the rotation as constructed can contend. The re-signing of Grady Sizemore and the re-signing of Cesar Jimenez are both solid depth moves that could help the Phillies improve in 2015. Both played decently well in limited roles for the team this past season, but neither is much more than a role player. Saying goodbye to Tony Gwynn Jr., Andres Blanco, and Sean O'Sullivan were all welcome things. Signing John Hester is basically a depth move. All of this matters more to the IronPigs than the Phillies. Of course the Phillies are "ready to deal veterans" as they are saying to people, but that is little more than code for "dump Howard" in my eyes. Larry Bowa was on WIP talking about needing to be "more athletic" and "strike out less" as a team. Ryan Howard is extremely unlikely to be back, unless the Phillies decide they can't possibly pay $50 million plus for a player to play elsewhere. It's the right thing to do though, as Ruf, Franco, or Utley all make more sense in that position. Beyond that though, I have mixed feelings about trading a veteran. Byrd? Sure. Utley? I've been for that. Rollins? And do what? Hamels? I still haven't seen a return worth it. Papelbon? Of course. Can now confirm: Oscar Taveras, 22, has died in a car accident in the Dominican Republic. Just awful. Any baseball fans who follows the young players of the game surely was looking forward to watching Tavares play. Scouts often likened Tavares to former Montreal Expos and Los Angeles Angels outfielder Vladimir Guerrero. This painful loss has hit the St. Louis Cardinals family entirely too often. Pitcher Darryl Kyle passed away in his sleep in 2002 while on the road in Chicago. 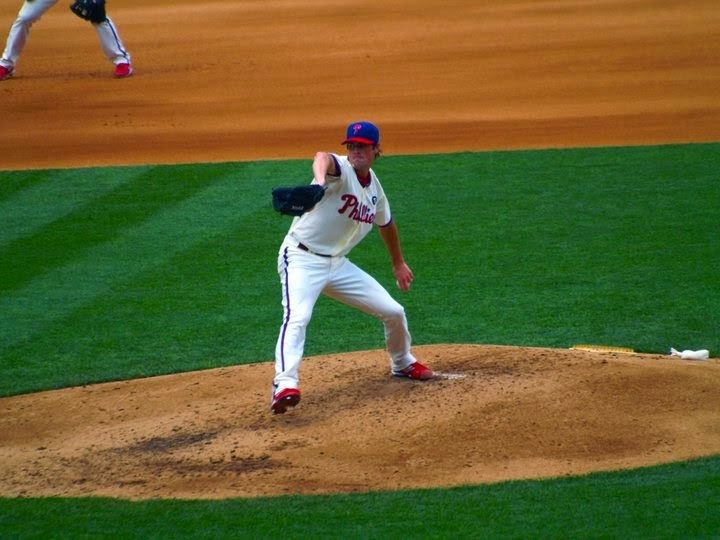 Former Phillies reliever Josh Hancock lost his life in 2007 while with the St. Louis Cardinals. Our thoughts and prayers are with the St. Louis Cardinals and Tavares' family. Tavares was just 22 years old.